I haven’t posted anything sweet and decadent lately and I’m really craving something sinful and sweet without the guilt. 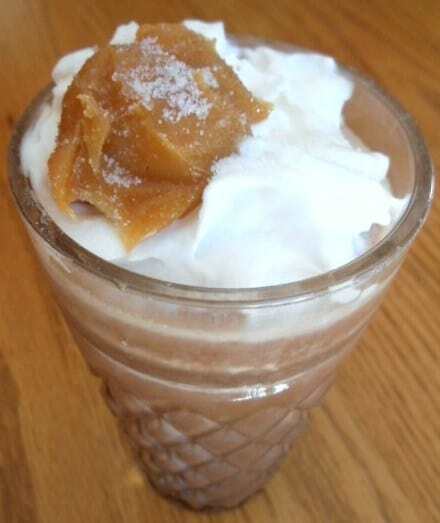 So I present to you a recipe for a Salted Caramel Cocoa-Ccino, courtesy of my new favorite cookbook author, Lisa Lillien, otherwise known as Hungry Girl. She’s awesome. Not sure how I’ve survived without her until now. I found this recipe in her cookbook, Hungry Girl To The Max! The Ultimate Guilt-Free Cookbook. 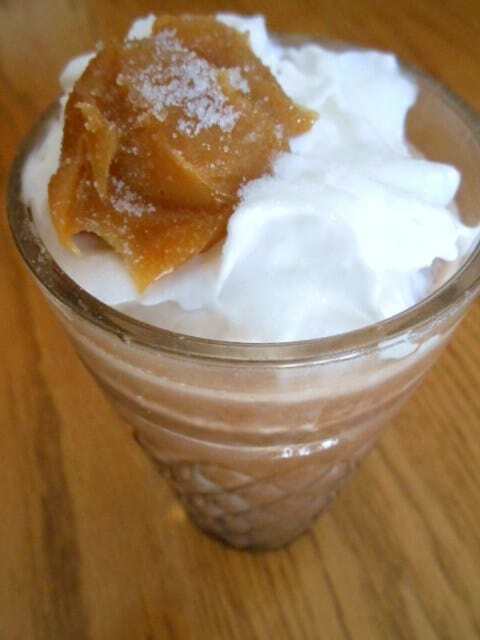 Salted caramel is my new obsession! Who doesn’t love sweet and salty? 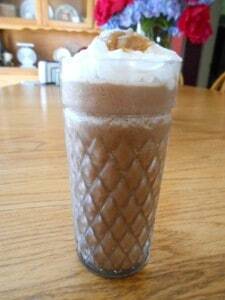 This frothy treat fits the bill for that craving. The title of this drink suggests that there is espresso in it, but there isn’t. I can’t see any reason why you couldn’t add that into this recipe though. 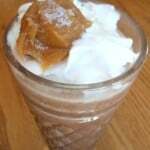 In a tall glass, combine cocoa mix with 1/3 cup hot water and stir to dissolve. 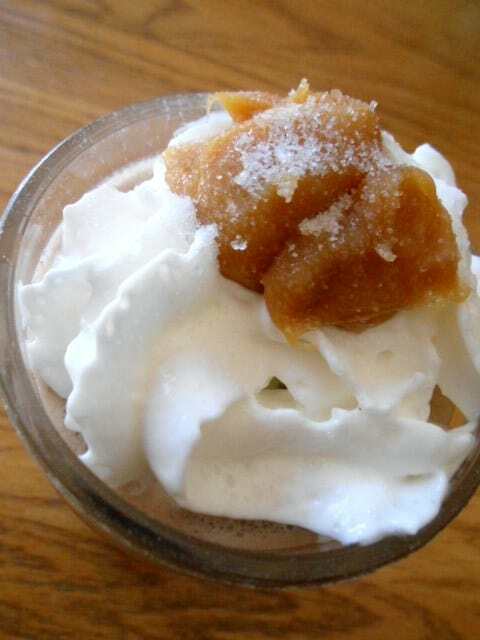 Add 2 teaspoons caramel dip and stir until melted. Add 1/3 cup cold water and ice, and blend at high speed until smooth. Pour and top with Reddi-wip and remaining 1 teaspoon caramel dip. Sprinkle with salt and sugar or Splenda and enjoy! 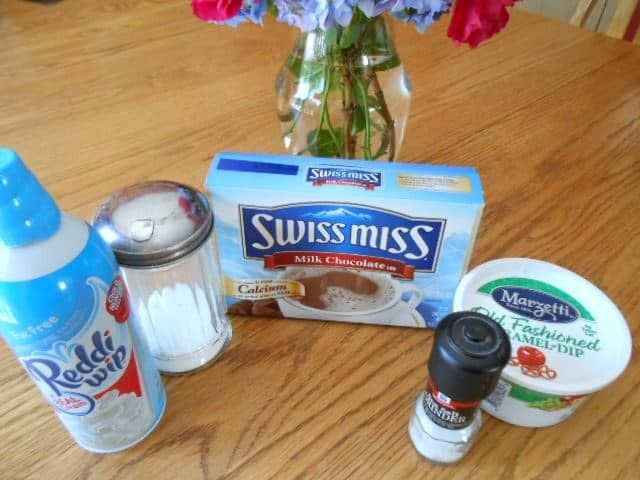 I didn’t have sugar free hot chocolate packets on hand so I used what I had. That would make a difference in the Points Plus Value. I also couldn’t find fat-free or light caramel dip. That would make a difference too. So my Cocoa-Ccino was probably more like a 6 Weight Watchers Points Plus Value. Not so good, but probably a lot better than the kind you can get at Starbucks – and a lot cheaper! Of course if you can find the fat-free, light varieties of all of the ingredients, this will be a good, healthy, guilt-free mid-afternoon or late evening treat. Mmmmmm! Look at the sea salt and sugar on top of that caramel! As you can see from the picture of the glass, it only makes 1 serving size. It’s not huge like the kind you get at Starbucks or McDonald’s or wherever else you can get these types of drinks. But it’s enough to satisfy that craving. So there ya go! Another great alternative to going the ‘Darn-it-I-regret-having-that!’ route. Enjoy! And stay tuned for more guilt-free, Weight Watchers friendly recipes.